Step 1 In a medium pan over medium heat, salute onion and garlic in oil. Add jackfruit, stock, syrup, lime juice, and Tabasco; stir to cover jackfruit, and simmer covered, stirring occasionally, until liquid has been completely absorbed, 7 to 10 minutes. Stir in seasonings and salt and cook, uncovered, until spices are absorbed into jackfruit, 2 minutes. 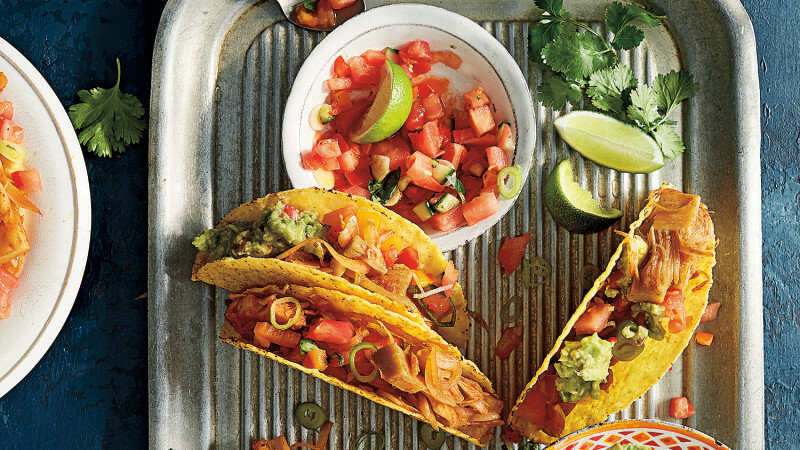 Divide jackfruit among taco shells, and garnish with guacamole, salsa, and cilantro, and serve with lime wedges. Jackfruit is a popular substitute for meat in Southeast Asia and India because it shreds nicely and picks up seasoning. It’s cumbersome to use fresh, so buy jackfruit canned and packed in water in the international sections at the market. Pat it dry, heat, and season like pulled pork, with jerk spices or barbecue spices.